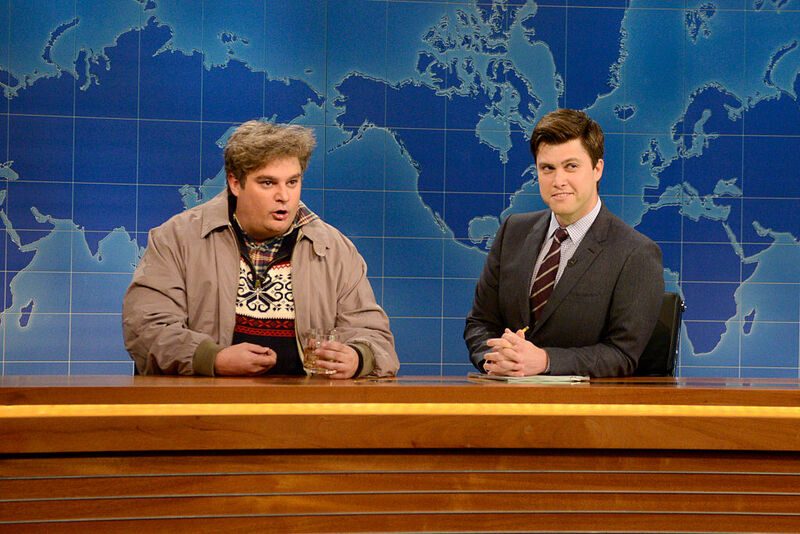 It’s time to get choked up — Drunk Uncle style — because Bobby Moynihan is officially leaving Saturday Night Live. The longtime cast member is departing the series after nine years to star in the upcoming CBS comedy Me, Myself, and I. Rumors surrounding Bobby Moynihan’s departure from the iconic sketch comedy series began a few weeks ago, when his CBS pilot got picked up to air this fall — but it wasn’t until yesterday that it was confirmed. Moynihan’s last show as cast member is set for this weekend’s Season 42 finale, with Dwayne “The Rock” Johnson hosting and Katy Perry serving as musical guest. The actor — whose most memorable characters include Drunk Uncle, secondhand news reporter Anthony Crispino, and The Jersey Shore’s Nicole “Snooki” Polizzi — has the second longest-running tenure of the current cast, after Kenan Thompson, who has been with the show for fourteen seasons. Most recently, Bobby Moynihan played New York Times reporter Glenn Thrush, who is constantly yelled at by White House Press Secretary Sean Spicer in the White House Press Briefings sketches. Just a few weeks ago, an Auto Shop sketch starring Moynihan and host Chris Pine featured an amazing RuPaul “lip sync for your life” battle. At the CBS upfronts, Moynihan remained coy about his departure from the long-running NBC series.When asked by E! News about his impending departure, he called Saturday Night Live his dream job. "Oh this question makes me so scared. My life's dream was to be on that show and I don't ever want to leave but you know, this [Me, Myself, and I] got picked up," Moynihan said. "It was the best. It was all I ever wanted to do." Bobby has been one of our SNL favorites for as long as we can remember. We’ll miss him so much during Season 43, but we can’t wait to check out Me, Myself, and I this fall on CBS!